Enrollment Good News (Except For The Data Analytics Workgroup)! 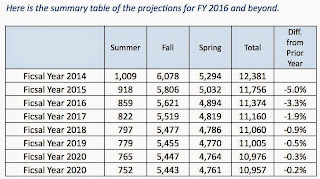 On February 16, 2015, Associate Vice President and Associate Provost Lisa H. Foss sent an email entitled: “FYE enrollment projections information.” A table from the email is reproduced below. Clearly, the data shows a projected decline for FY16 of 3.3%. As part of the 3.3% decline, the summer enrollment was projected to be down 59 FYE corresponding to a decline of 6.4%. From this data, the first table shows that summer enrollment is currently ahead of last year’s enrollment by 33 FYE. 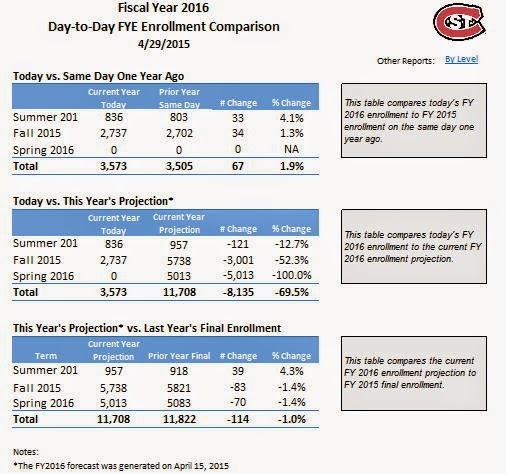 The second table shows that the projection for summer enrollment is 957 FYE. From the summary table of the enrollment projections, the summer enrollment projection was 859 FYE. Now, at 957 FYE, the projection is 98 FYE or 11.4% higher. The third table also shows that the current projection of 957 is 39 FYE or 4.3% ahead of the final number for summer 2015. This is all good news! February 15, 2015 the projection for summer was for being down 6.4%. Now, on April 15, 2015, after summer enrollment has occurred, the projection for summer shows an increase of 4.3%. From being down 6.4% to being up 4.3% corresponds to a differential of 10.7%. Anyone now want to talk about the accuracy of the enrollment projections of the Data Analytics Workgroup? Of course, IT IS a lot easier to make projections after registration has occurred. 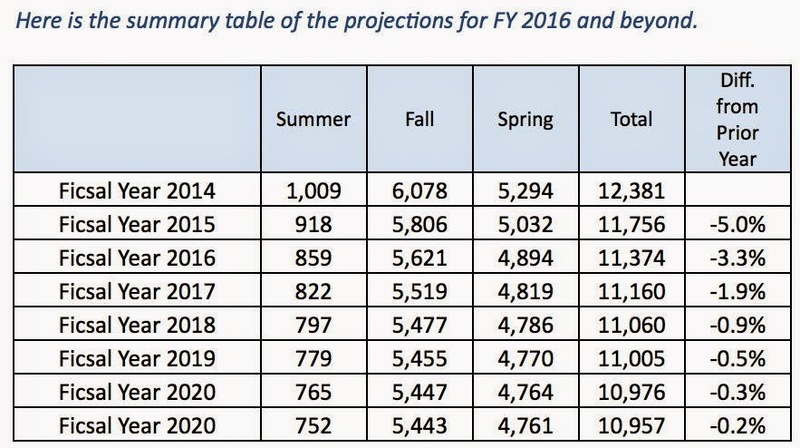 If you look at the third table, the overall projection for FY16 now calls for only a drop of 1.0%. 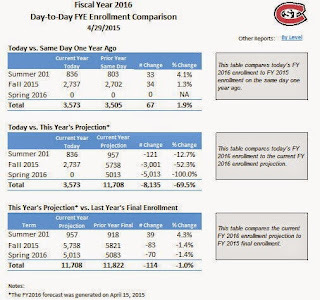 If the projections for fall and spring are off by as much as the projections were off for the summer, does SCSU really still have a budget problem? I might have looked at this slightly differently. If the enrollment is going to drop each year according to the first table isn’t that BAD!!!! news not good news? An excellent question for the CFO.